Claudio Monteverdi (b.Cremona, 1567; d.Venice 25 November 1643) was the most important composer of the early Baroque period. He lived at a time of great change in musical style. The first opera ever written was composed in 1597 by a composer named Jacopo Peri. Just eleven years later Monteverdi wrote an opera Orfeo which was a really great work. Other important operas of his are Il combattimento di Tancredi e Clorinda and Il ritorno d’Ulisse in patria. He wrote 9 books of madrigals. He also wrote a lot of church music including the 1610 Vespers. He was director of music at St Mark’s, Venice, which was the most important musical job in Italy. Monteverdi was the son of an apothecary and a doctor. He was very talented as a young boy and was only 15 when he published his first pieces of music. In the introduction to this music he says that his music teacher was Marc’ Antonio Ingegneri, the maestro di cappella of Cremona cathedral. We cannot find anything that shows that he sang in the cathedral choir. He probably had private music lessons. He learned composition, singing and how to play string instruments such as the viol and viola da braccio. He got several compositions published in Venice. By the time he got his first job he had already published two books of madrigals. His first job was working at the court of the Duke of Mantua. In Mantua there was a small band of excellent musicians. The musical director was the famous Giaches de Wert. Monteverdi got to know many famous poets, and there were famous singers at Ferrara which was not far away. At first Monteverdi had a low-paid job. He married the daughter of one of the court musicians in the string band. Monteverdi soon became well-known. He sent several of his compositions to be performed at Ferrara, and he went with the duke to when his army was fighting the Turks. The young Monteverdi was developing a new musical style. The old style was known as prima pratica (“first practice”) and the new style was called the seconda pratica (“second practice”). The prima pratica continued to be used for church music. In this style of writing the music was thought to be more important than the words. This meant that the music could be very contrapuntal, with several things going on at once so that the words could not be clearly heard. However, in the seconda pratica the words were more important than the music, i.e. it was important to be able to hear all the words clearly, and the music had to be simple enough for this to happen. This was particularly important in opera and in madrigals. There were a lot of arguments among musicians about these two styles of composition, and this is perhaps the reason why there was a gap of 11 years between Monteverdi’s 3rd and his 4th book of madrigals. His opera Orfeo (1608) was performed at least twice at court, and several times at Salzburg. Monteverdi was becoming famous all over Europe. Monteverdi went back to Cremona. His wife died, leaving him with their three small children. It was a terrible tragedy for Monteverdi, and he did not want to go back to Mantua, but the Duke wrote to him telling him he must come back to provide music for the wedding of Prince Francesco Gonzaga and Margharita of Savoy. Monteverdi returned to Mantua, where he composed his opera Arianna. The performance was a great success, and the audience were moved to tears by the music Arianna’s lament. This song is the only part of the opera that has not been lost. Although Monteverdi’s fame was increasing, there were a lot of arguments with his employer. Eventually he found another job, this time as a church musician, in the biggest church in Venice. Monteverdi had a difficult journey from Mantua to Venice. The passengers were robbed by highwaymen on the way. He arrived in Venice in October 1613. The job of maestro (director of music) at San Marco (Saint Mark’s church) in Venice was perhaps the most important job for a church musician in the whole of Europe. However, the music was in a bad state because previous directors of music had not been very good. Monteverdi started to reorganize the music there: he bought new music for the library and got some new musicians. He had to compose music for many special feast days during the year. He was doing a good job, and in 1616 his salary was increased to 400 ducats (about 44.28 ounces of gold, worth about $73,500USD today). The duke of Mantua was probably cross that he had lost such a good musician. He still asked Monteverdi to write music for him. Monteverdi probably had to obey, as he was still a Mantuan citizen (Italy did not become one country until more than two centuries later). He wrote music for important events such as weddings and carnivals at Mantua. By 1619 Monteverdi had published his seventh book of madrigals. However, he then started to publish less music. Perhaps it was because he was so busy, or perhaps because he no longer needed to look for fame. He probably wrote a lot of church music which is now lost. During the 1620s continued his work in Venice, although he may have tried to get other jobs. His hobbies include alchemy. He welcomed the composer Heinrich Schütz who visited Venice for a second time. After the Duke of Mantua died in 1626 Monteverdi wrote less music for Mantua. He was supposed to receive an annual salary from them, but he often did not get it. There was a war in Mantua, a lot of buildings were destroyed and the invading armies brought the plague. Monteverdi became a priest in 1632. It is not clear whether he did this because he really was religious or whether he thought it would help his career. In 1637 public opera was started in Venice. 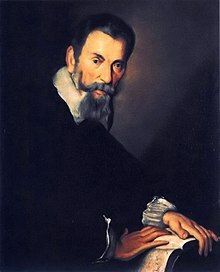 Monteverdi, who was now in his 70s, wrote operas for Venice. Il ritorno d'Ulisse in patria (1640) and L'incoronazione di Poppea (1642) form a brilliant end to his career. After the performance of this opera he made a six-month trip to Lombard and Mantua, where again he had to argue at the court about not being paid his pension. After he returned to Venice he was ill for nine days and then died. This page was last changed on 20 September 2016, at 11:37.